In a classroom or group, the leader takes a fairly well-known one-page “classic” poem (I’ve used Dickinson or Stevens in the past) and lists the words in the poem out on a separate page in alphabetical order and distributes copies to the class. Participants, provided with scissors, a glue-stick, and a large piece of paper, will cut up the list of words, and then use those words to make their own poem whichever way they want—visually and sonically—adding their own punctuation. (I have never yet had a student who guessed what the prototype poem was beforehand.) At the end of this process, each participant will read their own piece aloud, and everyone will observe that even though they were using the same words, each of their pieces will be as different as each of the people in the class. After hearing the pieces—without responding to them, just listening to their differences—the participants will walk around the table to look at how the pieces look visually on the page (this, too, will be different for each participant). Finally, the leader hands out the prototype poem and has someone in the group read it. At this point, it’s easy to feel that one’s piece falls short of the “famous” poem, but that’s not what is at stake here. The original poem is not debatable; it is what it is, and regardless of the exercise will remain what it is (perhaps even become more than what it is as a result of this method of close reading). What is important is to ask oneself the following: What do you notice about your own choices and what you think makes a poem? What form did you give your piece? What lines do you particularly like? What images? What in other people’s versions did you particularly appreciate? The point is obviously not to replicate the original, but to see what you did with the words in contrast to what others did with the list of words, and to witness that even when we use the same words, we bring to our writing our experiences, backgrounds, and emotions, and our own sensibilities. The source poem will show the group how each word works to make that particular poem, how no part of it is “redundant,” and that the poem is a very well-crafted “machine” as Williams would put it. This exercise, as the Surrealists and Dadaists have already demonstrated, can also be done on your own by taking a paragraph of a prose piece (this is preferable, as on your own you might be too influenced by a source poem and try to imitate it). You photocopy the paragraph, cut it up into separate words, then work from there cutting and pasting, as was done in the above exercise. Here, you might want to give the new version a specific form, like four words to a line (something to get you away from the prose source—I find that these types of constraints help to liberate and open the mind to more possibilities). The point here is not rewriting the original but seeing how you play and make use of words. Words are the material of poems, like daubs of paint make paintings, and this practice separates the word from the grip of syntax, from the mind that thinks that it knows best what it wants to say. If you were writing your own poem, you might not use the specific words in the source prose paragraph, but learning that “rose” can be used in a line by Robert Burns “O my Luve is like a red, red rose,” transformed into Gertrude Stein’s “Rose is a rose is a rose is a rose,” to Derek Walcott’s “force a rose from the sand” and further changed into “an attitude toward roses picked / in the morning air” in a poem by Barbara Guest, is learning that words have the power for much variety and combinatory power. Eléna Rivera was born in Mexico City and grew up in France. Her book of poetry Scaffolding (2017) is available from the Princeton Series of Contemporary Poets. Recent chapbooks include LE SOUCI FORMEL/the formal concern (Belladonna*, 2016) and her bilingual artist book Disturbances in an Ocean of Air (Estepa Editions, France, artwork by Kate Van Houten). Other books of poetry are Atmosphered (Oystercatcher Press), On the Nature of Position and Tone (Fields Press), and The Perforated Map (Shearsman Books). 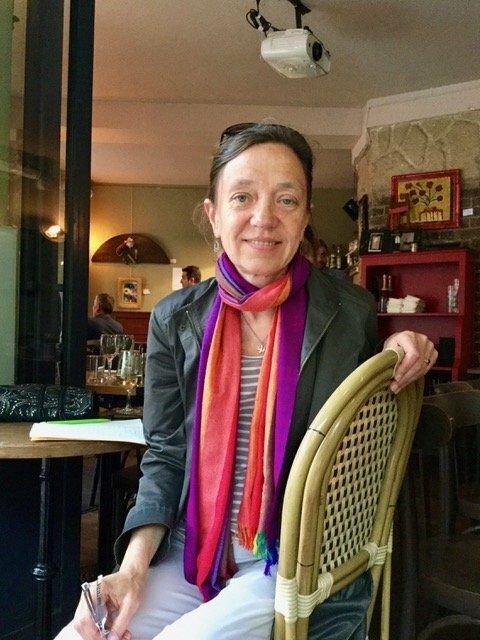 She recently translated books by Bernard Noël, Isabelle Garron, and Isabelle Baladine Howald. Find out more about Eléna Rivera at www.elenarivera.net.